Greek Orthodox Easter, called Pascha, is by far the most important feast for the Greeks, celebrating the suffering and martyrdom of Jesus Christ as well as, his resurrection and the chance of rebirth for mankind, symbolized by the coming of spring. Orthodox Easter is a family festivity deeply rooted in traditions, many of which originated in the very distant past. Throughout the country, many traditions such as special evening services take place during Holy Week (Megali Evdomada) that starts with Palma Sunday and ends with Easter Sunday. However, four main events form the basis of what we call Easter celebrations. On Great Thursday (Megali Pempti), Easter preparations begin with the dyeing of red eggs. Unlike the Easter eggs in other countries, the Greek Easter eggs can only be found in the red color, representing the blood of Christ. 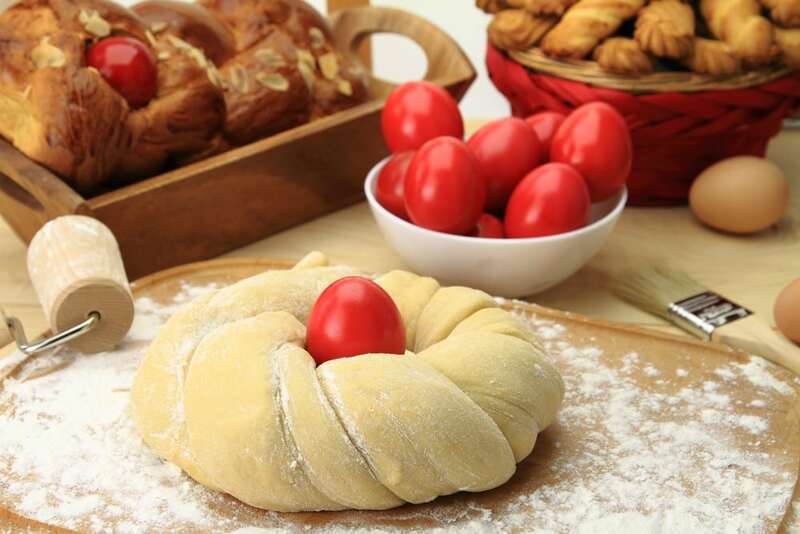 Commemorating the Last Supper, sweet Easter bread, called Tsoureki is being baked. During the special Great Thursday’s evening service, a traditional symbolic crucifixion takes place while women mourn through the night. The funerary procession of Epitaphios (mourning for the death and burial of Christ) takes place during Great Friday (Megali Paraskevi) throughout Greece. Church bells ring mournfully all day, a symbolic coffin representing Christ’s tomb is carried through the streets by the believers during the evening and people follow it in a quiet procession. The end of 40-day Lent and the resurrection of Christ are celebrated midnight on Great Saturday (Megalo Savvato). All people go to the church before midnight keeping their special candles, called Lambades for the Eternal Flame. A few moments before midnight the lights are switched off everywhere. The highlight of the Easter celebrations is during Anastasi, as when the clock strikes 12, the priest announces “Cristos Anesti!” (Christ is risen!) and people start greeting each other while many fireworks, crackers but also shotguns start firing to announce the happy moment. The Great Saturday Dinner takes place after midnight and consists of the traditional Magiritsa, made by the offal of the lamb and the cracking (tsougrisma) of the red eggs. 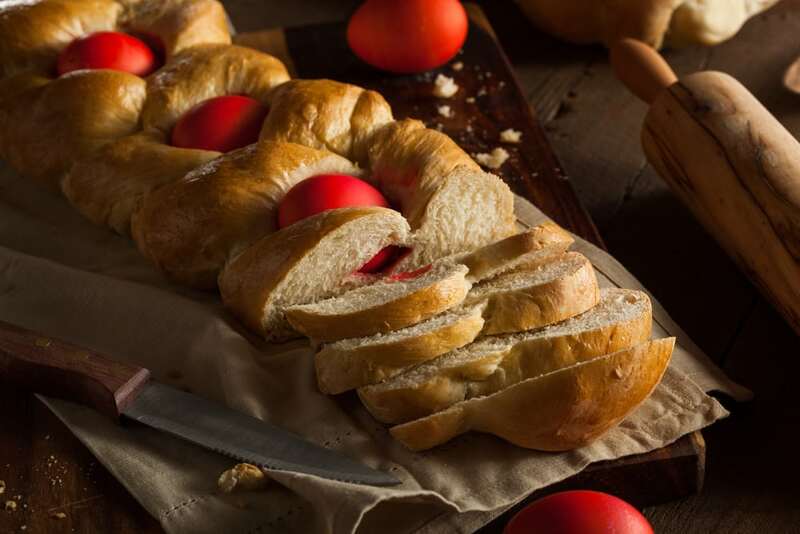 Easter Sunday (Kyriaki tou Pascha) is a joyful day of celebration, the most favorite of all days of the year for Greeks. Due to the great Mediterranean weather, families, relatives, and friends gather before noon, mainly in the countryside to prepare the festive Easter Sunday meal. 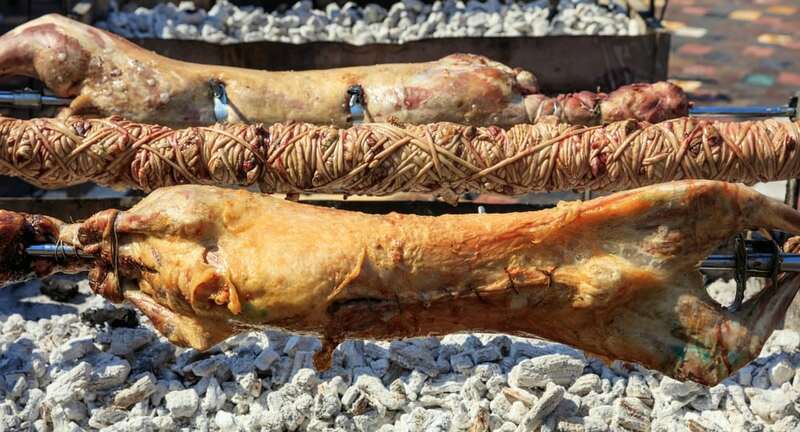 A cooking fire is set up outdoor where a whole lamb is roasted for many hours. It is accompanied by side dishes such as tzatziki, roasted potatoes, Greek salad and plenty of wine, ouzo, and raki. Then they all sit around a long table, for a long lunch accompanied by drinking, singing, and dancing until late at night. Apart from the main events celebrated throughout the country, not every place in Greece celebrates Easter in the same way. Below are some of the unique festivities with local flavor and distinctive traditions. Usually, Greek Orthodox Easter period occurs later than the Catholic Easter period. This year, Easter Sunday falls on April 9th. The celebration of Easter in Corfu is so spectacular giving a thought-provoking and joyous experience to the first-time visitor to the island. 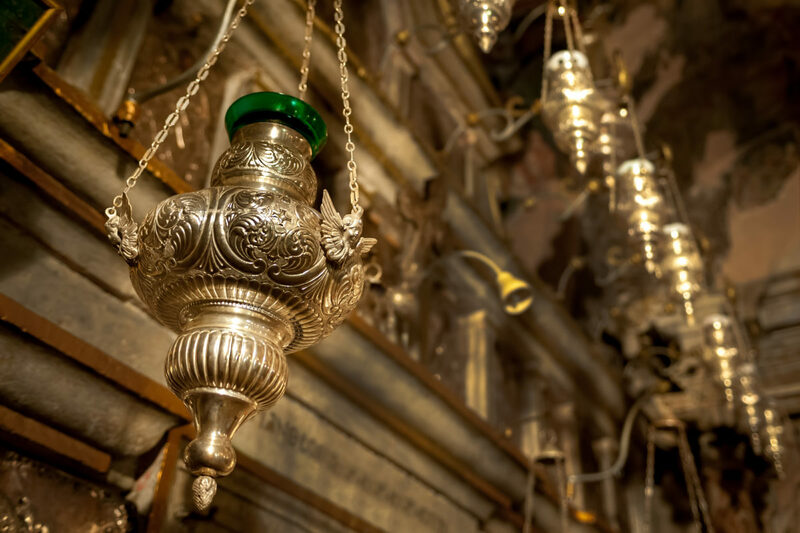 The customs and traditions of this huge festival are traced back to the Orthodox Christianity, Roman Catholic culture, Eastern influence, and pagan traditions. Variety of customs take place during Holy Week, among them the most impressive being the throwing of clay pitchers, called Botides. On Great Saturday at 11 am, in the historic Venetian center of Corfu town the Corfiotes throw ceramic pots of all sizes out of their windows and balconies, smashing them onto the streets and creating a deafening clamor. It is believed that the pot throwing symbolizes the exorcism of the evil spirits and death. In contrast to the rest of Greece, the procession of Epitaphios in Corfu takes place on Great Saturday morning, carrying the mummified remains of Corfu’s patron saint, St. Spyridon accompanied by the famous philharmonic bands of the island. Apart from the cultural opportunities of the Corfiot Easter, you will feel surprised by the natural beauties of the island, the green landscapes, the charming villages and the local cuisine which flirts with West and East flavors. Vrontados, being one of the villages of Chios Island in the northeastern Aegean Sea is famous for the relentless firework battle between two rival parishes sitting across a small valley. This festival called Rouketopolemos (Rocket war) takes place on the night of the Great Saturday and dates back to the age of Turkish occupation. Thousands of homemade rockets are fired toward each other churches while services are held. Having as a goal to strike the bell of the opposing church, this village is turned into a virtual battlefield. Many people, who use to visit Chios Island for enjoying this event, take the opportunity to spend time in the stunning medieval fortified villages of the island called Mastikikhoria, such as Mesta, Pyrgi, and Anavatos where the mastic tree’s resin is exclusively harvested worldwide. The Cretans always love to celebrate and there is often a feast somewhere on the Island. Easter celebration couldn’t be an exception for the locals. Many different customs are held during Holy Week. In Chania town and to be more specific, in Chalepa suburb of the town the tradition of “Burning of Judas” takes place on Great Saturday. When the clock strikes 12 midnight a giant effigy of Judas made by big pieces of wood and clothes is set alight as the priest declares “Christos Anesti” and fireworks go off. Be sure to explore the Venetian Old Town of Chania, which is one of the best-preserved cities in Greece and taste the Cretan cuisine, one of the healthiest and tastiest diets in the world. Kalamata town in Peloponnese is well known for the unique Easter custom of “Saitopolemos” (rocket war) taking place on Easter Sunday. It dates back to the revolution fights of 1821 against Ottomans when locals used these handmade making-loud-noise fireworks (Saitas) in order to strike fear into Ottoman army. A group of people called Saitologoi wearing traditional costumes detonate the Saitas while they are in their hands causing smoke, flashes and loud noise. Hydra Island, the gem of Saronic Gulf, celebrates Easter in an exclusive way reviving customs that are tied to the maritime history of the island. 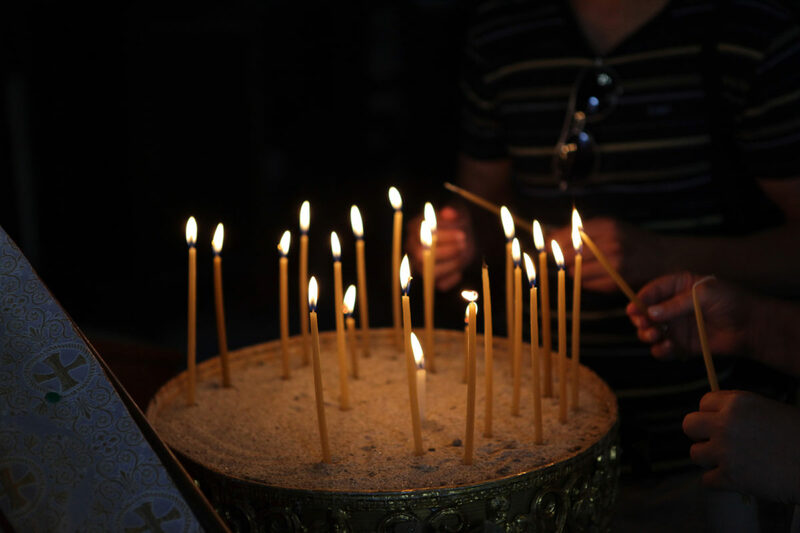 In the evening of Good Friday, villagers carrying candles follow the procession of Epitaphios through the cobbled streets of the village, which is ended up in the picturesque harbor of Kamini district. There, the believers who carry the symbolic coffin get in the sea, so that both the people and the sea are blessed by the Holy Epitaph. As the Epitaph is in the water, songs for the sponge divers and the island’s sailors are heard. In Arahova, a mountainous village nestling picturesquely at the foot of Mt. Parnassós in Viotia, Southern Greece, on Easter Day, the image of St. George is taken around the village, accompanied by about 500 people dressed in traditional costumes. On the following day, a road race of the elderly (uphill road) takes place, starting from the church of St. George and ending at the top of the hill. Each and every corner of Greece is worth visiting during the Easter week. For tailor-made trips please DM us.